VSM Engineers have worked as Project Engineers and Project Managers for various stormwater projects including neighborhood stormwater projects, storm sewer replacement, detention pond design, analysis of bridge/culvert structure capacities, review of storm sewer plans, channel improvement projects, and multiple objective designs for stormwater projects. VSM Engineering designed a storm water system for improvements made to Penn Valley Drive and 29th Street in Penn Valley Park. The design was optimized to reuse as much of the existing system as possible, while solving drainage problems on the site. Nearly 1500 feet of new storm pipe was designed, ranging in size from 15 inches to 36 inches. The improvements incorporated several green design solutions, including two water quality control features used in place of traditional storm inlets. VSM Engineering reviewed flooding and stormwater complaints at three locations around the Kansas City Metro. The projects included hydrologic and hydraulic analyses to define stormwater issues and develop various solutions and cost estimates for both structural and non-structural alternatives. The three sites included various combinations of water line relocation and sewer line replacement, bioswale, rain gardens, cascades, flumes, inlets and piping. 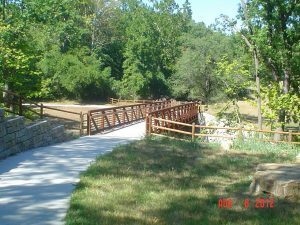 VSM Engineering provided civil engineering support for cross culvert design, trail plans and preliminary roadway designs for the Little Blue River Trail, Amity Trail, Triangle Trail, Line Creek and Second Creek Trails located in Kansas City. 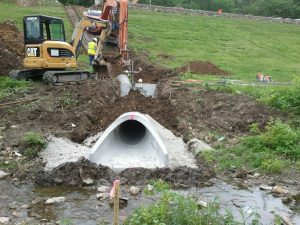 VSM was involved with the culvert designs for various culvert crossings, including large multiple cell pre-cast culverts which ranged from 24-in RCP to 240 SF. VSM completed the FEMA no-rise certification. VSM also served as engineer for 6,600 Linear Feet of trail from North Troost Avenue connecting Englewood Park to North East Vivion Road Trail. 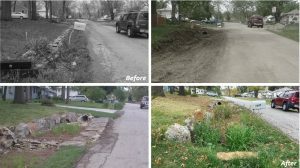 The project for the KCMO Parks Department included culverts, a pedestrian bridge and a Storm Water Pollution Prevention Plan (SWPPP).